Looking for a quick and easy recipe for salmon? Here it is! This recipe only requires 4 ingredients and is a quick option if you're pressed for time on a weeknight. It's also on the healthier side, so is perfect for those days when you're looking to eat light. I seasoned the salmon with Cajun seasoning, but you can easily substitute this with some salt, pepper and a sprinkle of cayenne pepper. It gives the fish a nice hint of heat. 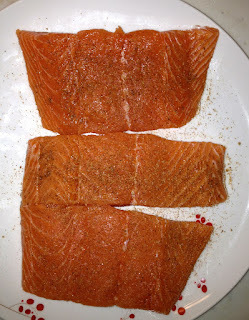 Pat the salmon filets dry and rub with Cajun seasoning. (If you don't have this on hand, you can easily just use salt and pepper with a sprinkle of cayenne pepper). 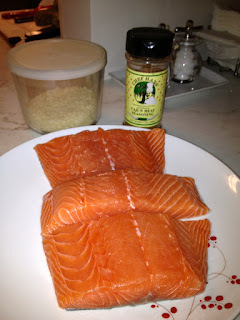 Press panko onto the salmon filets. 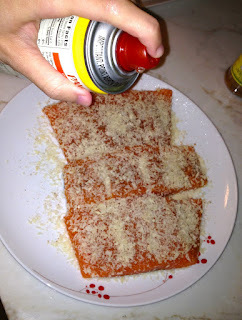 Give a really quick and light spray of Pam Cooking Spray over the salmon. You only need a little, just enough to help the panko crust a bit. Very quickly spray some Pam over the salmon! Place salmon on an aluminum lined tray and bake at 400 degrees for 15-18 minutes. The fish is done when it flakes with a fork and is opaque on the inside. Lookie at that pretty crust! Serve with a side of sauteed spinach and rice!